Download "AS Relationships, Customer Cones, and Validation"
2 this section. Finally, a single organization may own and operate multiple ASes; we leave the inference of sibling relationships as future work because it is difficult to distinguish them from route leaks. We make the following contributions: We introduce a new algorithm for inferring c2p and p2p links using BGP data. Our algorithm builds on three generally accepted assumptions about industry structure: (1) there is a clique of large transit providers at the top of the hierarchy; (2) most customers enter into a transit agreement to be globally reachable; and (3) cycles of c2p links (e.g., where ASes A, B, and C are inferred to be customers of B, C, and A respectively) should not exist for routing to converge. Our algorithm achieves near-perfect accuracy for both p2p and p2c links for the subset of relationships we were able to validate, using the largest set of externally gathered AS relationship validation data collected to date. Since even our three different sources of validation data disagree by 1%, our algorithm reaches the limit of accuracy achievable with available data. We evaluate our algorithm s accuracy by validating 43,613 (34.6%) of our inferences the largest validation of AS-relationships performed to date. First, we received nearly 2400 directly reported relationship assertions from operators through the interactive feedback functionality of our public repository of AS relationships . Second, we use policy information encoded in the RIPE WHOIS database to extract more than 6,500 unique relationships; we extract only relationships between ASes where both ASes have policies recorded in the database and both policies are expressed consistently. Third, we extract more than 41,000 relationships using community strings encoded in BGP messages by ASes who publish how these strings map to AS relationships. Our validation data, 97% of which we can share (we cannot share directly reported relationships) will itself contribute to a research area that has long suffered from lack of validation. 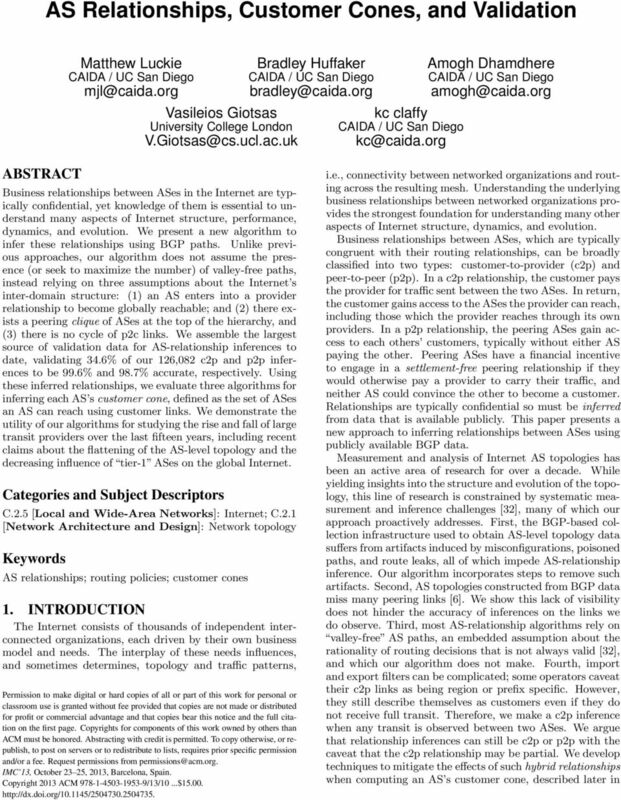 We introduce a new algorithm for inferring the customer cone of an AS. The customer cone of AS X is defined as the set of ASes that X can reach using p2c links; for AS X the customer cone includes X s customers, as well as X s customers customers, and so on. The customer cone is not a methodologically clean construct, since some ASes have hybrid relationships; for example, they peer in some regions (or some prefixes), but one AS will purchase from the other for other regions (or other prefixes). We compare the strengths and weaknesses of three distinct approaches for computing customer cones, and explain why we believe one approach is more accurate. We also show how this construct informs our understanding of evolutionary trends such as the flattening of the Internet topology and the financial consolidation of the Internet transit industry. 2. RELATED WORK GaowasthefirsttostudytheinferenceofASrelationships. Her solution relies on the assumption that BGP paths are hierarchical, or valley-free, i.e., each path consists of an uphill segment of zero or more c2p or sibling links, zero or one p2p links at the top of the path, followed by a downhill segment of zero or more p2c or sibling links. The valley-free assumption reflects the typical reality of commercial relationships in the Internet: if an AS were to announce routes learned from a peer or provider to a peer or provider (creating a valley in the path), it would then be offering transit for free. Gao s algorithm thus tries to derive the maximum number of valley-free paths, by selecting the largest-degree AS in a path as the top, and assuming that ASes with similar degrees are likely to be peers (p2p). Gao validated her results using information obtained from a single Tier-1 AS (AT&T). Xia and Gao  proposed an improvement to Gao s algorithm that uses a set of ground truth relationships to seed the inference process. Transit relationships are then inferred using the valley-free assumption. Gao s algorithm  is used for remaining unresolved links. They validated 2,254 (6.3%) of their inferences using 80% of their validation data and found their algorithm was accurate for 96.1% of p2c links and 89.33% of p2p links. Subramanian et al. formalized Gao s heuristic into the Type of Relationship (ToR) combinatorial optimization problem: given a graph derived from a set of BGP paths, assign the edge type (c2p or p2p, ignoring sibling relationships) to every edge such that the total number of valley-free paths is maximized. They conjectured that the ToR problem is NP-complete and developed a heuristic-based solution (SARK) that ranks each AS based on how close to the graph s core it appears from multiple vantage points. Broadly, as in Gao , ASes of similar rank are inferred to have a p2p relationship, and the rest are inferred to have a p2c relationship. Di Battista, Erlebach et al. proved the ToR problem formulation was NP-complete in the general case and unable to infer p2p relationships. They reported that it was possible to find a solution provided the AS paths used are valley-free. They developed solutions to infer c2p relationships, leaving p2p and sibling inference as open problems. Neither Subramanian et al. or Di Battista, Erlebach et al. validated their inferences; rather, they determined the fraction of valley-free paths formed using their inferences. Dimitropoulos et al. created a solution based on solving MAX-2-SAT. They inferred sibling relationships using information encoded in WHOIS databases. 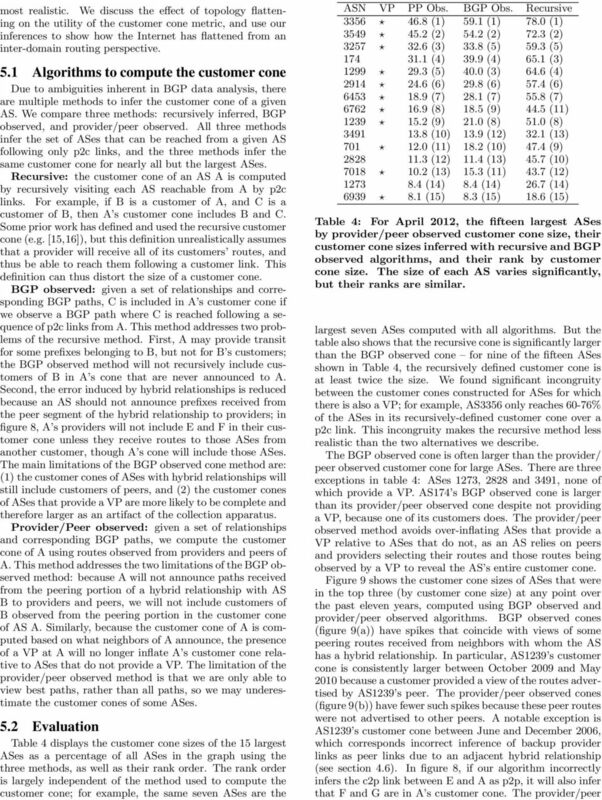 Their algorithm attempted to maximize two values: (1) the number of valleyfree paths, and (2) the number of c2p inferences where the node degree of the provider is larger than the customer. The algorithm uses a parameter α to weight these two objectives. They validated 3,724 AS relationships (86.2% were c2p, 16.1% p2p, and 1.2% sibling) and found their algorithm correctly inferred 96.5% of c2p links, 82.8% of p2p links, and 90.3% of sibling links. Their validation covered 9.7% of the public AS-level graph and has thus far been the most validated algorithm. However, MAX-2-SAT is NP-hard and their implementation does not complete in a practical length of time for recent AS graphs. UCLA s Internet Research Laboratory produces AS-level graphs of the Internet annotated with relationships . The method is described in papers by Zhang et al. and Oliveiraet al.. TheiralgorithmbeginswithasetofASes inferred to be in the Tier-1 clique, then infers links seen by these ASes to be p2c; all other links are p2p. Zhang  describes a method to infer the clique; Oliveira  assumes the Tier-1 ASes are externally available, such as a list published by Wikipedia. There are a growing number of regionspecific c2p relationships visible only below the provider AS, causing this approach to assign many p2p relationships that are actually p2c. Gregori et al. used a similar approach; for each AS path, their algorithm identifies the relationships possible and infers the actual relationship based on the lifetime of the paths. None of [23, 29, 37] describes validation. 5 C:0 D:0 ASN Transit Degree A:2 B:3 Path 1: C A B E Path 2: C A B F Path 3: A D E:0 F:0 Figure 4: Computing the transit degree of ASes using paths. While the node degrees of ASes A and B are both three, A s transit degree is two because A it is not observed to announce D s prefixes to any neighbors. Nodes with a transit degree of zero (C, D, E, F) are stub ASes. 4. RELATIONSHIP INFERENCE Our algorithm uses two metrics of AS connectivity: the node degree is the number of neighbors an AS has; and the transit degree is the number of unique neighbors that appear on either side of an AS in adjacent links. Figure 4 illustrates the transit degree metric; ASes with a transit degree of zero are stub ASes. We use transit degree to initially sort ASes into the order in which we infer their relationships, breaking tiesusingnodedegreeandthenasnumber. ASesinferredto be in the clique are always placed at the top of this rank order. Sorting by transit degree reduces ordering errors caused by stub networks with a large peering visibility, i.e., stubs that provide a VP or peer with many VPs. 4.1 Assumptions We make three assumptions based on discussions with operators and generally understood industry structure. Clique: multiple large transit providers form a peering mesh so that customers (and indirect customers) of a transit provider can obtain global connectivity without multiple transit provider relationships. A provider will announce customer routes to its providers. All ASes, except for those in the clique, require a transit provider in order to obtain global connectivity. We assume that when X becomes a customer of Y, that Y announces paths to X to its providers, or to its peers if Y is a clique AS. Exceptions to this rule include backup and region-specific transit relationships. The AS topology can be represented in a directed acyclic graph. Gao et al. argue there should be no cycle of p2c links to enable routing convergence . 4.2 Overview Algorithm 1 shows each high-level step in our AS relationship inference algorithm. First, we sanitize the input data by removing paths with artifacts, i.e., loops, reserved ASes, and IXPs (step 1). We use the resulting AS paths to compute the node and transit degrees of each AS, and produce an initial rank order (step 2). We then infer the clique of ASes at the top of the hierarchy (step 3). After filtering out poisoned paths (step 4), we apply heuristics to identify c2p links (steps 5-10). Finally, we classify all remaining unclassified links as p2p. Our algorithm contains many steps, a consequence of trying to capture the complexity of the real-world Internet and mitigate limitations of public BGP data . The output from this process is a list of p2c and p2p relationships with no p2c cycles, by construction. Algorithm 1 AS relationship inference algorithm. Require: AS paths, Allocated ASNs, IXP ASes 1: Discard or sanitize paths with artifacts ( 4.3) 2: Sort ASes in decreasing order of computed transit degree, then node degree ( 4) 3: Infer clique at top of AS topology ( 4.4) 4: Discard poisoned paths ( 4.3) 5: Infer c2p rels. top-down using above ranking ( 4.5) 6: Infer c2p rels. from VPs inferred not to be announcing provider routes ( 4.5) 7: Infer c2p rels. for ASes where the provider has a smaller transit degree than the customer ( 4.5) 8: Infer customers for ASes with no providers ( 4.5) 9: Infer c2p rels. between stubs and clique ASes ( 4.5) 10: Infer c2p rels. where adjacent links have no relationship inferred ( 4.5) 11: Infer remaining links represent p2p rels. ( 4.5) 4.3 Filtering and Sanitizing AS Paths We first sanitize the BGP paths used as input to our algorithm, especially to mitigate the effects of BGP path poisoning, where an AS inserts other ASes into a path to prevent its selection. A poisoned path implies a link (and thus relationship) between two ASes, where in reality neither may exist. We infer poisoning, or the potential for a poisoned path, in AS paths (1) with loops, or (2) where clique ASes are separated. We filter out paths with AS loops, i.e., where an ASN appears more than once and is separated by at least one other ASN. Such paths are an indication of poisoning, where an AS X prevents a path from being selected by a non-adjacent upstream AS Y by announcing the path X Y X to provider Z, so if the route is subsequently received by Y it will be discarded when the BGP process examines the path for loops . For BGP paths recorded in April 2012, 0.11% match this rule. After we have inferred the clique in step 3, we also discard AS paths where any two ASes in the clique are separated by an AS that is not in the clique. This condition indicates poisoning, since a clique AS is by definition a transit-free network. For BGP paths recorded in April 2012, 0.03% match this rule. We also filter out paths containing unassigned ASes; in BGP paths from April 2012, we observed 238 unassigned ASes in 0.10% of unique paths. 222 of these ASes are reserved for private use and should not be observed in paths received by route collectors. In particular AS23456, reserved to enable BGP compatibility between ASes that can process 32-bit ASNs and those that cannot , is prevalent in earlier public BGP data and can hinder relationship inferences. We also remove ASes used to operate IXP route servers because the relationships are between the participants at the exchange. Unfortunately we know of no public database of IXP route server ASes, nor do we know of any algorithm that reliably identifies an IXP route server. To identify IXP route server ASes, we manually searched for IXP ASes using a combination of routing and WHOIS data: if the name of the AS in WHOIS contains RS or IX, we include the AS in our list if the AS announces less address space than a /23. This process yielded a list of 25 ASes known to operate route servers; we remove these ASes from paths so that the IX participants are adjacent in the BGP path. 6 Figure 5: ASes inferred to be in the clique over time. We plot the 22 of the 26 ASes inferred to be in the clique at any time after uary The clique s small size and consistent membership lend confidence in our inference methodology. AS names change over time so we do not label them. As an artifact of the AS3356/AS3549 merger process in 2013, clique member AS6461 was inferred not to be in the clique. Finally, we discarded all paths from for May and June 2003, and from between March and November 2012; the former reported paths with ASes removed from the middle of the path, and the latter reported paths inferred from traceroute. 4.4 Inferring Clique We attempt to infer the ASes present at the top of the hierarchy. Since Tier-1 status is a financial circumstance, reflecting lack of settlement payments, we focus on identifying transit-free rather than Tier-1 ASes. First, we use the Bron/Kerbosch algorithm  to find the maximal clique C 1 from the AS-links involving the largest ten ASes by transit degree. 1 Second, we test every other AS in order by transit degree to complete the clique. AS Z is added to C 1 if it has links with every other AS in C 1 and it does not appear to receive transit from another member of C 1; i.e. no AS path should have three consecutive clique ASes. Because AS path poisoning may induce three consecutive clique ASes in a false BGP path X Y Z, we add AS Z to C 1 provided there are no more than five ASes downstream from X Y Z. A nominal value of five ASes will still capture clique ASes even in paths poisoned multiple times, yet is unlikely to wrongly place a large transit customer in the clique since a clique AS is likely to announce (and we are likely to observe ) more than five customers of large transit customers. If an AS would be admitted to C 1 except for a single missing link, we add that AS to C 2. Finally, because an AS might be in C 1 but not in the clique, we re-use the Bron/Kerbosch algorithm to find the largest clique (by transit degree sum) from the AS-links involving ASes in C 1 and C 2. The product of this step is a clique of transit-free ASes. Figure 5 shows ASes inferred to be in the clique since uary Nine ASes have been in the clique nearly every month, and ASes that are inferred to be in the clique are 1 Starting with ten ASes reveals most clique ASes and is small enough to prevent the incorrect inference of a clique below the top of the hierarchy. If there are multiple cliques, we select the clique with the largest transit degree sum. almost continuously present. The consistency of the inferred clique and our discussions with operators give us confidence in our clique inference methodology. However, peering disputes and mergers of ASes can disrupt our inference of the clique. ASes may form alliances to prevent de-peering incidents from partitioning their customers from the Internet. If such a disconnection incident triggers activation of a backup transit relationship, a peer will disappear from the clique and instead be inferred as a customer of the allied peer. The process of merging ASes can can also result in peers being inferred as customers. For example, in 2013 Level3(AS3356) gradually shut down BGP sessions established with Global Crossing (AS3549), shifting sessions to AS3356. In order to maintain global connectivity during this merger process, Level3 advertised customers connected to AS3549 to peers that were only connected to AS3356. As a result, ASes in the clique appeared to be customers of AS3356, when in reality they were peers. Specifically, in figure 5, AS6461 was not inferred to be a member of the clique because it had shifted all peering ports with Level3 to AS Inferring Providers, Customers, and Peers The remainder of the algorithm infers p2c and p2p relationships for all links in the graph. Step 3 infers p2p relationships for the full mesh of links between clique ASes. The rest of this section uses figure 6 as reference. AS path triplets: We make inferences using only AS path triplets (adjacent pairs of links). Triplets provide the constraints necessary to infer c2p relationships while allowing us to ignore non-hierarchical segments of paths, and are more computationally efficient than paths. For example, in figure 6 we break path 1 into two triplets: and Notation: We use the notation in table 1 to describe relationships between ASes. A p2c relationship between X and Y is presented as X > Y. The notation reflects providers as typically greater (in degree or size or tier of a traditional hierarchical path) than their customers. A triplet with no inferred relationships is presented as X? Y? Z. 13 Fraction Cogent 3356 Level3 701 Verizon 3549 Level3 (GBLX) 3257 Inteliquent 1239 Sprint 3561 Cent Link (SV) Figure 11: Fraction of ASes in X s customer cone that were reached via X from an AS in X s customer cone over time. Most ASes show a decline in the fraction of cone-internal paths. Fraction nonclique nonclique clique clique clique nonclique clique nonclique Figure 12: Characteristics of nodes or links at top of each path. The fraction of paths crossing a nonclique peering link peaked in uary VPs because they reveal the peering links they use. For each VP that provides a full view to RV or RIS and is also in X s customer cone, we compute the fraction of cone-internal paths, i.e., fractionofpathsfromthatvpthattransitx(the cone s top provider) when reaching another AS in X s cone which is not also in the customer cone of the VP. Figure 11 shows the five-month moving average of this fraction for the seven ASes once they have at least 1000 ASes in their cone. Five of these networks show a steady decline in the fraction of cone-internal paths. To explore this decline in the use of these top (clique) providers to transit traffic, we evaluate the topological characteristics of top links of each path. Figure 12 plots the fraction of nodes or links in each topological category since 2002, forasetofsevenvpsthatconsistentlyprovidedapublicview. 2 Between2002and2006thefractionofpathswhere the top link was a peering link between two non-clique ASes rose from 15% to 40% of paths, while the fraction of paths where the top link was a peering link between two clique ASes fell from 30% to 10% of paths in Since 2006, the fraction of observed paths crossing a peering link between a clique AS and a lower-tier AS has increased, while the frac- 2 ASes 513, 1103, 1221, 2497, 3333, 4608, and tion of paths using a non-clique peering link has dropped. Considering all paths using clique ASes to reach destinations (clique-nonclique links, clique-clique links, or clique nodes at the top of paths), over 80% of paths used some clique AS back in 2002, bottoming out in 2006 (just above 60%), followed by a slow rise back to 77% today. This trend reversal is perhaps a result of Tier-1 ASes adjusting peering strategies as a reaction to ASes peering below the clique (so-called donut peering) to recover some transit revenue. Our AS relationship inferences also shed light on the continually increasing richness of peering in the Internet. As the number of full VPs has increased an order of magnitude since 2000 (from 12 to 125 in October 2012), the number of p2p links observable from these VPs jumped by two orders of magnitude (from about 1K to 52K), and increased as a fraction of the entire graph from 10% (in 2000) to 38%. (even after the number of full VPs stabilized in 2008). This increase in peering (flattening) was not observed by individual VPs, most (75%) of which experienced almost no change in the fraction of links inferred as p2p. Instead, the increase in relative presence of p2p links in the graph is due to individual VPs seeing more unique p2p links. 6. SUMMARY AND FUTURE WORK We have presented, and validated to an unprecedented level, a new algorithm for inferring AS relationships using publicly available BGP data. Our algorithm tolerates prevalent phenomena that previous algorithms did not handle. We validated 34.6% of our relationship inferences, finding our c2p and p2p inferences to be 99.6% and 98.7% accurate, respectively. Since even different sources of our validation data disagree by 1%, our algorithm reaches the limit of accuracy achievable with available data. We have published 97% of the validation data set, the relationship inference code, and inferred relationships publicly at http: // Analysis of the Internet at the AS granularity is inherently challenged by measurement and inference in a dynamic complex network. A known concern is that public views of the AS topology capture only a fraction of the p2p ecosystem, since so few ASes share their full view of the Internet with BGP data repositories. Another challenge is the variety of complex peering relationships that exist, which may be possible to infer by adapting our algorithm or incorporating additional data from either the control or data plane. Meanwhile, we have derived techniques to mitigate the effects of such relationships on application of relationship inferences. Our inferences shed new light on the flattening Internet topology, revealing a decline in the fraction of observed paths traversing top-level (clique) ASes from 2002 (over 80%) bottoming out in 2006 (just above 60%), followed by a slow rise back to 77% today, perhaps as these clique ASes adjust their peering strategies to try to recover some transit revenue. Our customer cone metric reveals other interesting aspects of Internet evolution: the largest customer cone in the Internet has rarely had more than half of the routed ASes in it. In 2000, AS701 had a customer cone that contained half of the active ASes, and today AS3356 s cone has half of the active ASes. 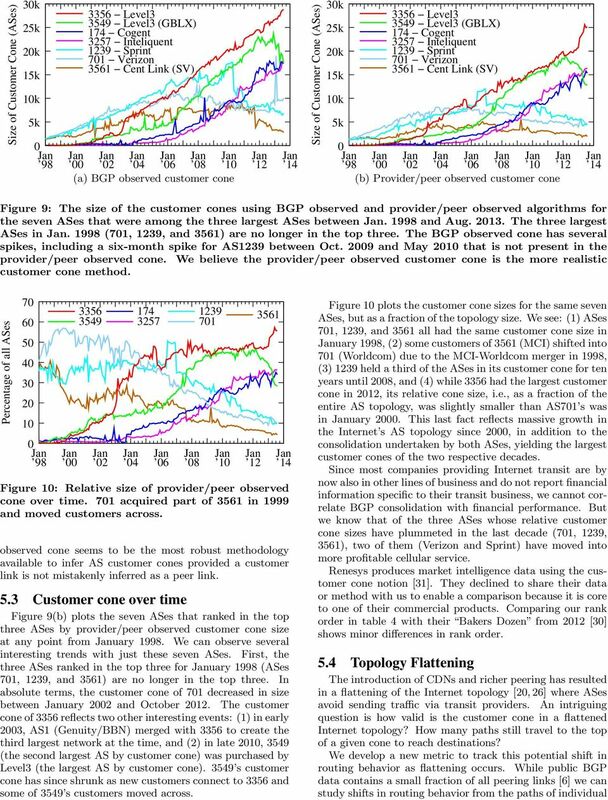 An area of future research would be to explore the predictive capabilities of customer-conerelated metrics on Internet evolution and dynamics, such as characteristics that correlate with an impending switch from a c2p to a p2p relationship. 14 Acknowledgments We thank the numerous operators who contacted us with validation data and candidly discussed aspects of their network s operations. We thank Robert Beverly, David Clark, Xenofontas Dimitropoulos, Dimitri Krioukov, and Olaf Maennel for their feedback on an earlier version of this paper. We also thank the anonymous reviewers and Ethan Katz- Bassett for their feedback. 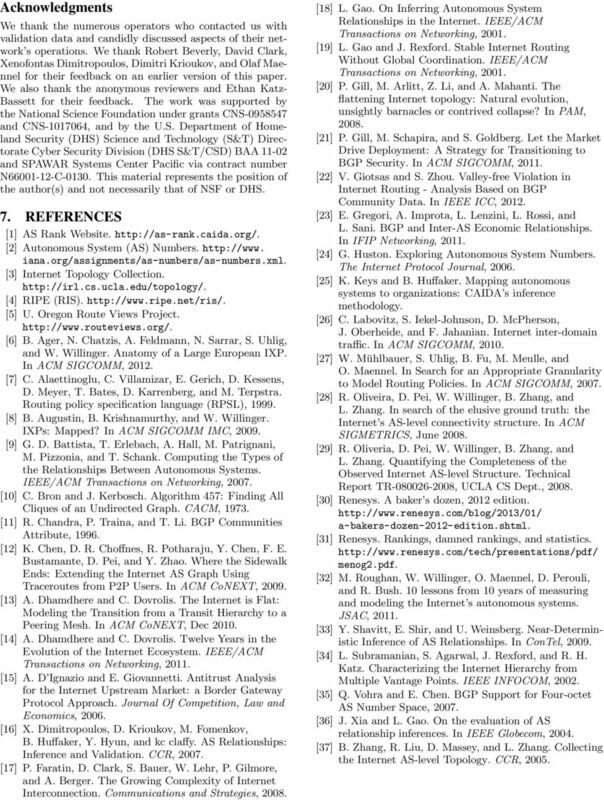 The work was supported by the National Science Foundation under grants CNS and CNS , and by the U.S. Department of Homeland Security (DHS) Science and Technology (S&T) Directorate Cyber Security Division(DHS S&T/CSD) BAA and SPAWAR Systems Center Pacific via contract number N C This material represents the position of the author(s) and not necessarily that of NSF or DHS. 7. REFERENCES  AS Rank Website. Autonomous System (AS) Numbers. iana.org/assignments/as-numbers/as-numbers.xml. Internet Topology Collection. RIPE (RIS). U. Oregon Route Views Project. B. Ager, N. Chatzis, A. Feldmann, N. Sarrar, S. Uhlig, and W. Willinger. Anatomy of a Large European IXP. In ACM SIGCOMM,  C. Alaettinoglu, C. Villamizar, E. Gerich, D. Kessens, D. Meyer, T. Bates, D. Karrenberg, and M. Terpstra. Routing policy specification language (RPSL),  B. Augustin, B. Krishnamurthy, and W. Willinger. IXPs: Mapped? In ACM SIGCOMM IMC,  G. D. Battista, T. Erlebach, A. Hall, M. Patrignani, M. Pizzonia, and T. Schank. Computing the Types of the Relationships Between Autonomous Systems. IEEE/ACM Transactions on Networking,  C. Bron and J. Kerbosch. Algorithm 457: Finding All Cliques of an Undirected Graph. CACM,  R. Chandra, P. Traina, and T. Li. BGP Communities Attribute,  K. Chen, D. R. Choffnes, R. Potharaju, Y. Chen, F. E. Bustamante, D. Pei, and Y. Zhao. Where the Sidewalk Ends: Extending the Internet AS Graph Using Traceroutes from P2P Users. In ACM CoNEXT,  A. Dhamdhere and C. Dovrolis. The Internet is Flat: Modeling the Transition from a Transit Hierarchy to a Peering Mesh. In ACM CoNEXT, Dec  A. Dhamdhere and C. Dovrolis. Twelve Years in the Evolution of the Internet Ecosystem. IEEE/ACM Transactions on Networking,  A. D Ignazio and E. Giovannetti. Antitrust Analysis for the Internet Upstream Market: a Border Gateway Protocol Approach. Journal Of Competition, Law and Economics,  X. Dimitropoulos, D. Krioukov, M. Fomenkov, B. Huffaker, Y. Hyun, and kc claffy. 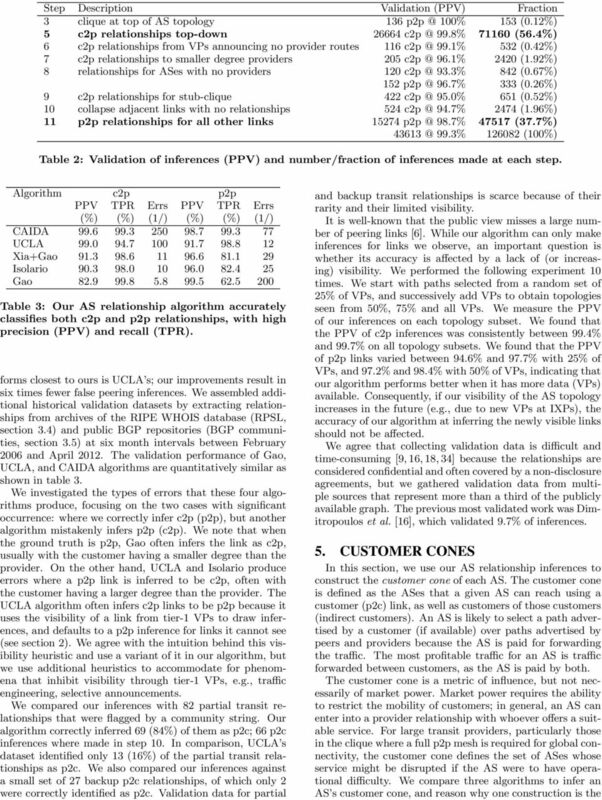 AS Relationships: Inference and Validation. CCR,  P. Faratin, D. Clark, S. Bauer, W. Lehr, P. Gilmore, and A. Berger. The Growing Complexity of Internet Interconnection. Communications and Strategies,  L. Gao. On Inferring Autonomous System Relationships in the Internet. IEEE/ACM Transactions on Networking,  L. Gao and J. Rexford. Stable Internet Routing Without Global Coordination. 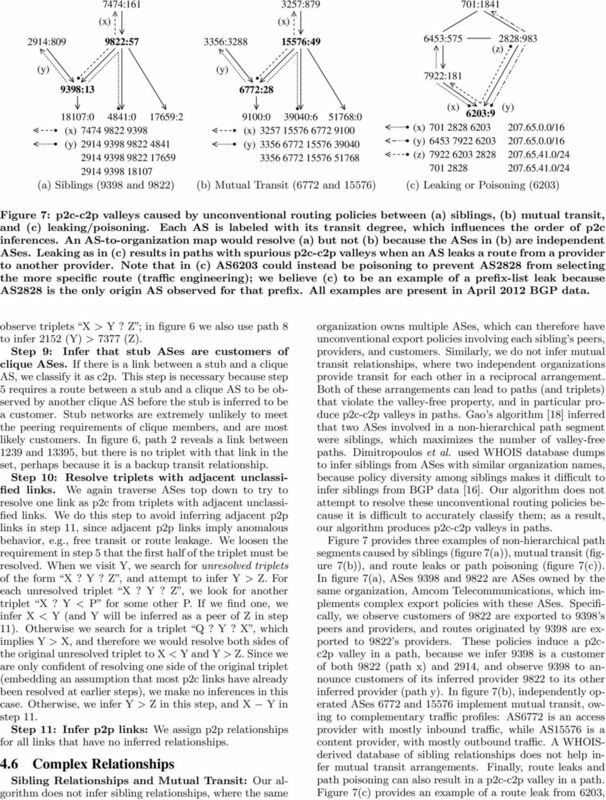 IEEE/ACM Transactions on Networking,  P. Gill, M. Arlitt, Z. Li, and A. Mahanti. The flattening Internet topology: Natural evolution, unsightly barnacles or contrived collapse? In PAM,  P. Gill, M. Schapira, and S. Goldberg. Let the Market Drive Deployment: A Strategy for Transitioning to BGP Security. In ACM SIGCOMM,  V. Giotsas and S. Zhou. Valley-free Violation in Internet Routing - Analysis Based on BGP Community Data. In IEEE ICC,  E. Gregori, A. Improta, L. Lenzini, L. Rossi, and L. Sani. BGP and Inter-AS Economic Relationships. In IFIP Networking,  G. Huston. Exploring Autonomous System Numbers. The Internet Protocol Journal,  K. Keys and B. Huffaker. Mapping autonomous systems to organizations: CAIDA s inference methodology. C. Labovitz, S. Iekel-Johnson, D. McPherson, J. Oberheide, and F. Jahanian. Internet inter-domain traffic. In ACM SIGCOMM,  W. Mühlbauer, S. Uhlig, B. Fu, M. Meulle, and O. Maennel. In Search for an Appropriate Granularity to Model Routing Policies. In ACM SIGCOMM,  R. Oliveira, D. Pei, W. Willinger, B. Zhang, and L. Zhang. In search of the elusive ground truth: the Internet s AS-level connectivity structure. In ACM SIGMETRICS, June  R. Oliveria, D. Pei, W. Willinger, B. Zhang, and L. Zhang. Quantifying the Completeness of the Observed Internet AS-level Structure. 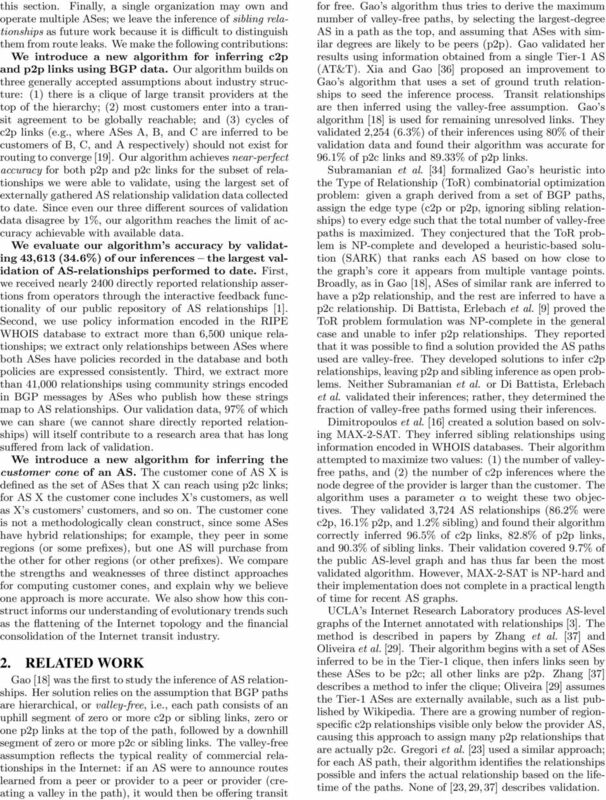 Technical Report TR , UCLA CS Dept.,  Renesys. A baker s dozen, 2012 edition. a-bakers-dozen-2012-edition.shtml. Renesys. Rankings, damned rankings, and statistics. menog2.pdf. M. Roughan, W. Willinger, O. Maennel, D. Perouli, and R. Bush. 10 lessons from 10 years of measuring and modeling the Internet s autonomous systems. JSAC,  Y. Shavitt, E. Shir, and U. Weinsberg. Near-Deterministic Inference of AS Relationships. In ConTel,  L. Subramanian, S. Agarwal, J. Rexford, and R. H. Katz. Characterizing the Internet Hierarchy from Multiple Vantage Points. IEEE INFOCOM,  Q. Vohra and E. Chen. BGP Support for Four-octet AS Number Space,  J. Xia and L. Gao. On the evaluation of AS relationship inferences. In IEEE Globecom,  B. Zhang, R. Liu, D. Massey, and L. Zhang. Collecting the Internet AS-level Topology. CCR, 2005. JCR or RDBMS why, when, how?